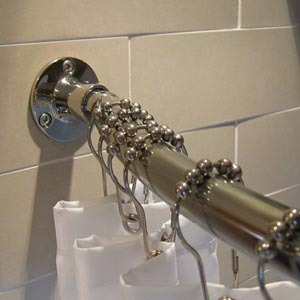 Shower Curtain Rings are the link between the Shower Curtain Rail and the Shower Curtain. All shower curtains need to be attached to the curtain rod with something and we think we have a great range of Shower Curtain Rings to finish off your rail and curtain combination perfectly. Our most popular Shower Curtain Ring remains the Roller Ball Rings pack and all of our Shower Curtain Rings are stunning quality, easy to fit and will last and last. We have seen similar shower curtain rings in a number of top class high street stores at double our price, so you can be assured you are getting a great deal when you choose our Byretech Shower Curtain Rings. Our Curtain Rings will fit any of our Stainless Steel' shower rails - All Byretech Stainless Steel Shower Rails are 25.4mm or 1" ( one inch ) in diameter.